UNIST News Weekly to be relaunched as a monthly. UNIST has relaunched its digital publication, the “UNIST News Weekly” with a return to a monthly format. With the new launch of its digital publication, each month UNIST will feature a curated selection of the week’s featured stories, recent news, and event information to the UNIST community, delivered right to your inbox. 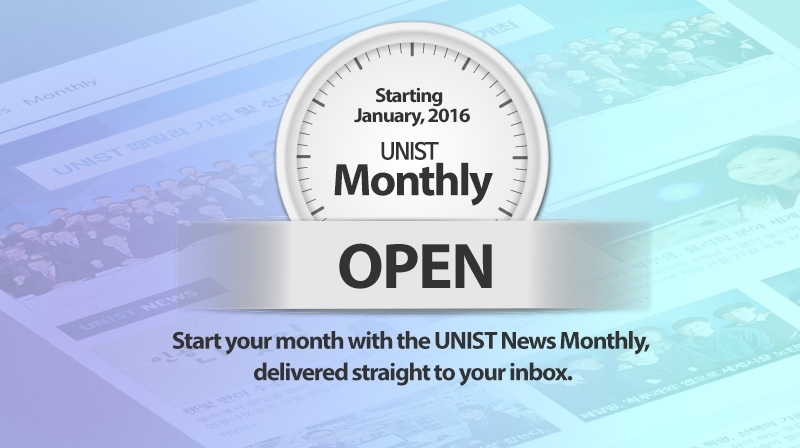 The first issue of UNIST News Monthly is expected to be delivered to your inbox in January, 2016. The UNIST News Monthly offers well-written, approachable content with important UNIST stories in the media, sent monthly to people both inside and outside of UNIST. Moreover, the newsletter also provides the latest on research highlights, student accomplishments, and alumni updates, all designed to reflect UNIST’s unique culture, energy, and excitement. In addition to the month’s most memorable stories on technology, science, and more, the UNIST News Monthly also features an exclusive collection of campus images via a photo-sharing site, Flicker. Our monthly electronic newsletter replaces a full-length print article with clickable links, allowing readers to have an easy access to the full articles at a website. Moreover, you can also share news articles you enjoy with your friends, family, and followers. Start your month and dive into the UNIST News Monthly, delivered right to your inbox!